LOS ANGELES—Seeking to expand on two of their most beloved properties, 20th Century Fox executives have approved production on United 93 vs. 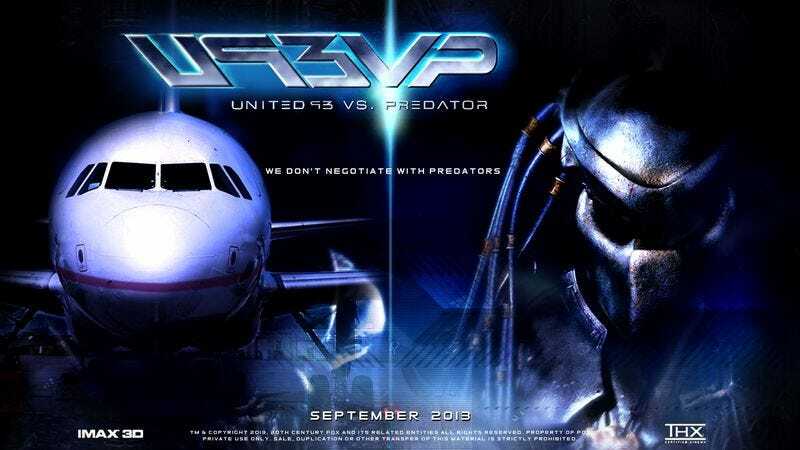 Predator, a crossover film speculating what might have happened the morning of Sept. 11, 2001, if a team of self-cloaking alien hunters had also been aboard the doomed flight that crashed in Shanksville, PA. “This film will ramp up the action and tension in the original United 93 by a factor of five,” Fox vice president Adam Bronford promised Tuesday, adding that the film’s tagline will be “We Don’t Negotiate with Predators.” “In addition to terrorist hijackers, the passengers will face traveling carnivorous space chameleons who blend into their surroundings and pick off passengers one by one for their alien blood sport. We won’t give out any spoilers, but it’s fair to say a planeload of brave, freedom-loving Americans will prove to be more than those Predators bargained for.” If the film is a success, New Line Cinema will reportedly green-light the script for Freddy vs. Jason vs. New Year’s Eve on the Achille Lauro.